I start a new job in a few weeks which comes with a 25% bump in pay, so I am going to try and get these paid off by the end of October. Can't wait to be debt free. Congratulations, @Jim Fiction !! Enjoy staring at the zero balances and basking in your accomplishment! Congrats Jim! How does it feel? Paying all the medical bills for Baby #3's arrival this month so just a small dent to these. We're really looking forward to seeing that 3 in front go away. I am new to the forums and happy to have some extra motivation to get rid of my student loan debt. My original balance was around $135,000 when I graduated law school in 2014 and I have $45,275.29 remaining that I want to pay off by June 2020. Currently, I am focusing all extra payments on a 6.55% interest loan with a $14,097.92 principal balance. Ugh. My "final" payment went through, but apparently I miscalculated and underpaid. By $0.04. SoFi won't let me do a payment online. Anyone know what their policy is when the balance is that small? Thanks! 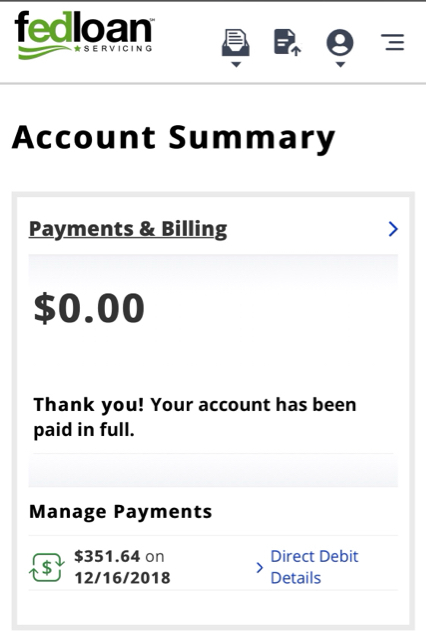 Still fairly surreal at this point, I assume it will really sink in next month when I don't have to make any payments. In other news, I knocked off 3 of the existing loans! Sure, they were the smallest ones at the highest interest rate BUT THEY ARE GONE. No more interest on those ever. Awesome. The rest of the loans have larger balances so it will take a bit longer to see each one paid in full, but I'll be able to chase them down one by one. Thought I posted in this thread....it looks like it may have been the 2017 edition. We threw our tax return at it, which helped and I bumped the auto payment to $1250. Goal is pay off by ~ Spring 2020. Pretty happy with the progress over the last few months-wife was on maternity leave, so our income was reduced, but things are still chugging along. I have a tendency to obsess over things and lately this has been, "the thing." I either need to kill it quickly or find something else to neurotically work on. -Have some "extra" money coming in the form of a FSA withdrawal, so I think I'll get it under $50k this month! They waive it! You can reach out to the customer service to confirm. All 4 will be under 4k after this month's payment. I've been adding between $500-700 extra each month. I'll need to do an additional $800 or so to meet the 2018 goal. I'm still shooting for a June 2019 payoff. Congratulations to all the finishers and everyone making progress. You are motivation to keep going! 2/22/18 - $81,748.39 @2.57% variable rate (Put my after tax amount from my new job's signing bonus into attacking the balance). 2/27/18 - 74,821.93 @ 2.64% used our federal return to pay it down. Unfortunately the variable rate increased with LIBOR so the rate went up by .07%. The war on my student loan balance is raging. I am finally below $80k. This means the principal reached the half way mark. I badly want another financial windfall to make another extra payment. Waiting on State tax return now to make another extra payment. 4/1/18- $68,738.42 @2.88% another LIBOR increase screwing up my world. Fortunately it’s still under what my rate would have been if fixed. I increased my monthly payment from $2,500 to $3,000.00. It’s full bore warfare on student loans. Ugh. The existence of this loan balance gnaws at me in a way I can’t describe. I’m paying an extra $1000 this upcoming week because I desperately need to see the balance keep decreasing. $64,400.12 @2.90%. Interest rates continue to rise, but still lower than if I had chosen a fixed rate. $60,858.43 @2.97% interest rates continue to rise, but still under 3.25% that it would have been if it were fixed. $57,506.99 @ 3.10% seems like every post involves an interest rate increase. $37,560.72 @3.10% I’ve paid about $70,000 toward this balance since January....insane. DH got a bonus so we were able to put a significant payment toward the loan. We also killed off another loan, so we're down from 14 separate loans to 10. We're doing the avalanche method and paying the loans off that have the highest interest rates, from lowest to highest balance. And with a small bonus hopefully coming my way this month plus DH's raise which takes affect, I'm hoping we can accelerate the pay down even more. Excited to keep making more progress! Thank you! And doesn't it though?! Who knew #adulting responsibly could be so fulfilling? The 2018 challenge has started! I graduated in 2006 with over $30k and only occasionally focused on paying them off, but I have now been out of school for over 10 years and these need to be gone. Sept was a really crazy month for work. I had planned to make that payment at the end of the month to save a couple days of interest but this morning was the 1st free time I had to log in. Hopefully 2 more payments and they I will be complete done with student loans!! Medical bills all paid off now. Knocked out that silly 3 in front! Looking forward to turning the firehouse back at these for the rest of the year and into next year! I think back in February this year I posted I had $21,800 to go. Today I have $9,650 (2 student loans at 3%) remaining. Wish it could have been at $7k, but I had a couple licensing exams I didn't pass, so I had to pay to retake those (grr) and I had to pay for some professional affiliation membership fees, too. >:( No one in the office ended up getting a mid-year bonus this year, so the hope is we all still get the end-of-the-year bonus, which would really help me out here. Kind of bummed about various things, I could have been much further along, but I'm still paying it down as much as I can, regardless. I have not been able to do "side gigs" because of needing to spend time on studying. I don't have any other debt so at least I'm almost at the finish line, but it's frustrating nonetheless. Try to celebrate what you HAVE accomplished, everyone of us can look back and point out things we should have done better or differently but we can't change the past. Just make sure that our next decision is the best possible one we can make with the information we have. I finally got out of some tax / consumer debt in Nov. 2017 so I decided to get serious about repaying my student loans quickly. I should have been posting in this thread all along... I don't know why I wasn't hitting these harder earlier ... but I'm doing it now. Graduated law school in 2016 with $39,000. Mostly from Undergraduate as I had a full ride to law school - I took one loan during law school for stupid reasons and I've already face punched my self. I am going to make a $650 payment now to bring my balance down into $33k! I think I am able to keep my payments in the $1k to $1.4k range for the foreseeable future! My goal is to pay these loans off by the time I am 30. I turned 28 two weeks ago. It is totally doable on my salary, I just need to bite the bullet and throw the money at the loans. I figure posting here will help. Also, I am slated to get a bonus in March 2019 that will hopefully cover the balance of the loans. So I could hit this goal before I am 29 which would feel awesome. I know nothing is guaranteed, so that is why I plan on throwing money at them now. Plus why would I want to accrue more interest??? If I get the bonus and it is higher than my loan balance I can throw that into an investment account! Seeing the posts about ZERO BALANCES is so inspiring! I love this. July was NOT a frugal month by any stretch of the imagination. I am doing frugal month challenge this month, so hopefully I can make another $1k payment. It is a little addicting seeing the balance go down! I am going to get it into the 20s this month ... with an extra payment next week. I'm excited for that milestone! My efund is larger than my (previously 6-figure) student loan balance. I really, really want to pay it off. But I don't want to be without an efund at a job I've only had for two weeks. I want to have them paid off by 12/31/18 and it looks like I'm on track to do it! That’s awesome, lexde! Even though you’re choosing not to eradicate it right now (seems like a smart move to me given all the life stuff you’ve been handling), it’s great that you have the option to do it. Wiped out two more loans - now I’m down to 8. My goal is to be under the 35k mark by end of year, with 6 loans to finish off. Currently tracking toward the goal, which means being free of these loans by June 2019. I'm seriously impressed by your pacing over the course of only 8 months. Major kudos to you, zeli! I couldn't resist ... had to get it into the 20s! I knew I was getting paid today so put as much as I could from my checking into another payment! I paid $2,200 this month!! Lexde, how big is your e-fund? Also IMPRESSIVE that you've made so much progress on 6-figures worth of debt! I think we graduated law school around the same time (based on what I've read in your journal.) I feel like we are both so far ahead of our peers. Feels good. Thank you for this message. I really needed to read that. I could definitely work on being more positive on this. Funnily, for me, working on paying down debt goes hand-in-hand with working on positivism. I reached my 2018 goal of paying off $10K, I was hoping to get under $50K this month but alas it'll be next month. I decided to put some of my "extra" money into an EF account since that was pretty much nothing. I think I'll finish the year off around $47K. Hi everyone! Finally a thread that makes sense for me to contribute to :). Let's get these suckers paid off! A little background: I am a 25yo CPA that moved to a HCOL last year and found MMM in July. Since then I have read the blog and made WAY too many spreadsheets. I am just now starting to make a foray into the forums. My wife and I have been frugal by nature throughout our marriage and have thrown money at these loans which started at $110-$120k but we didn't keep as good of track of them as we are now. These loans are entirely mine but my wife has no issue with working together to take them out. Her schooling was thankfully paid for by her parents. I have been out of school for a little over 2.5 years. Together we bring home roughly 97k after tax and 401k. We budget to put $4k to loans each month and put any surplus from our budgeting towards them as well (this month an extra $500!). TLDR: Loans are stupid and we will get rid of them. Back to making steady progress likely throughout the rest of the year (unless one of us gets a year end bonus which has happened the last few years but won't count on it). Goal is to get it under $35k by the end of this year and we are on track for that. My husband and I have both decided to get more focused on our student loans. It’s so inspiring to see everyone tracking their progress on here so I’ve decided to join in the fun! We’re both in the medical field and started out with about $320,000 in loans between the two of us. As of today our loan amount is $150,298.14. I’m owed some back pay from work so within the next few months we’re hoping to get that down by a good amount and then we’ll throw every extra penny at it. Here’s to being student debt free! Welcome! This group is great for motivation. I really got serious about my husband's loans about a year ago, and posting/following everyone's progress is encouraging. I love the final posts when student loans are paid off, too! Positive peer pressure. My goal is under $10,000 by December 31, which is in reach! I want them all to be gone by June next year, but we've also got some aggressive savings goals next year, so I might shift it a few months but definitely by the end of the year. I really really want to pay these off before the end of the year but I have a dilemma. I planned to pay these off with 1 final payment in Dec but there is only $X extra in the budget, it is enough to pay these off but not to do that and take care of a few other things that are coming up. I need new tires on the car and have a couple other bills that are due Nov/Dec some of these thing were planned for but my estimates were to low. Do I sacrifice my arbitrary goal of paying these off before the end of the year to pay for these other bills/tires or do I take the late fee/interest associated with pushing these things off until Jan and pay off my student loans by my goal date? It isn't like my interest rate on the student loans are low but that cost would be lower than pushing these other things off until Jan. I know what makes more sense mathematically but I am really struggling with the emotional win of being done with student loans and the fact that they have been pushed back for several years because (it seems like) there is ALWAYS something more pressing to pay for. How much in interest/late fees are we talking about? Psychological wins are huge but if it’s going to put you way behind in late fees, I think it makes more sense to say pay them off next month. What are you leaning towards? We may not quite make the December goal but Jul 2019 should still be doable. Onward! Make the minimum payment and get the snow tires and whatever for safer driving. Paying off your student loans a little later is not that big of a deal and paying them off is rather anti-climactic too, at least it was for me. Also, congrats on being so close! Not much in late fees/interest I think it would actually end up being taken care of by a little bit of CC float until we could direct the extra toward these things in Jan but I am leaning towards pushing the SL payment back. Not loving the idea of purposely putting us into a float situation. The minimum payment is low so I am sure that it will be very anti-climatic (it was for the other SLs too) and that is probably what I am going to do but it really annoys me. Can you purge some things you've been meaning to get rid off anyway? Take on a short term side gig like Uber for the added money? Reduce holiday spend and instead buy a debt payoff celebration gift? Yeah, we just sold 5 sheep that were supposed to turn into groceries but none of us could do it. There are other items on the usually places looking for a buyer. I will NOT do a side gig (face punch or kick me out of the MMM club but it is not happening) I value my time with my family much higher than what any of those things could pay me. BUT thank you for the suggestions. Bit the bullet last week and my payment cleared a few days ago. See you guys on the other side! For me, the remaining loans are all 3-4% so will not be in a hurry. Completed what I set out to do in this arena!